Taxonomists currently recognize nearly 100 distinct lemur species, all of which are endemic to Madagascar and the Comoros Islands. Though these small primates have existed for thousands of years, their life spans are easily disrupted as a result of their confined natural habitat, poor reproductive success and increased human interaction. Compared with other larger primates like gorillas and chimpanzees, lemurs have a relatively short life expectancy. Lemurs in captivity can live for more than 30 years, though the average is about 25. Wild lemurs, however, are only expected to live on average 16 to 20 years, depending on species. Lemur reproduction is extremely seasonal and quick. The mating season occurs from mid-April to June; female lemurs are in estrus, or fertile, for less than one day. This fast-paced biological clock makes lemur reproduction precarious. Lemurs also have a slow reproduction rate -- generally giving birth to one offspring each year, though twins may occur if food is particularly plentiful. With such a slow reproduction rate, it’s imperative that lemurs have the natural resources needed for survival. These resources include trees, large shrubs and an abundance of leaves and fruits to feed on. Habitat destruction is one of the main threats to lemur longevity and population. Deforestation, fires, urban development, overgrazing of livestock and logging have destroyed a majority of lemurs' natural habitat. 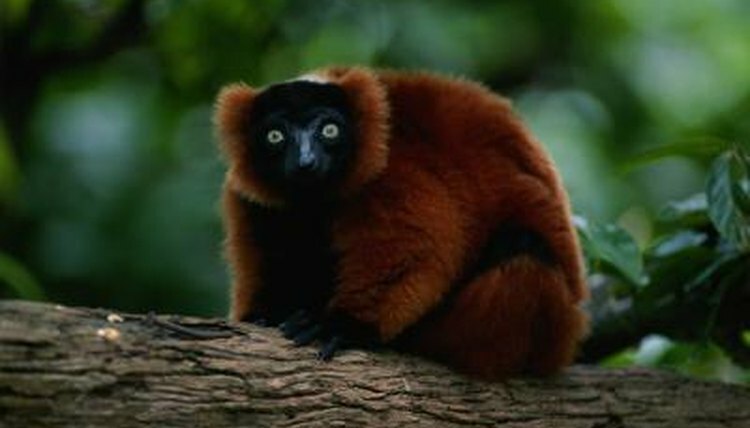 Hunting also threatens lemur populations. According to the IUCN Red-List of Threatened Species, 23 lemur species qualify as critically endangered, 52 are endangered and nineteen are vulnerable to extinction. Ninety-one percent of all lemur species are assessed as threatened. Lemur populations are dwindling at an alarming rate; the rarest lemur in the world, the northern sportive lemur (Lepilemur septentrionalis), has only 17 remaining individuals. Many lemur species such as the endangered red-ruffed lemur (Varecia ruba) are now officially protected within national parks and wildlife areas. Captive breeding, scientific research, education and reintroduction programs are working to reverse declining lemur populations and increase life expectancy for these primates as a whole before extinction becomes a reality. How Many Mantled Howler Monkeys Are Left? What Monkeys Live in the Himalayas?